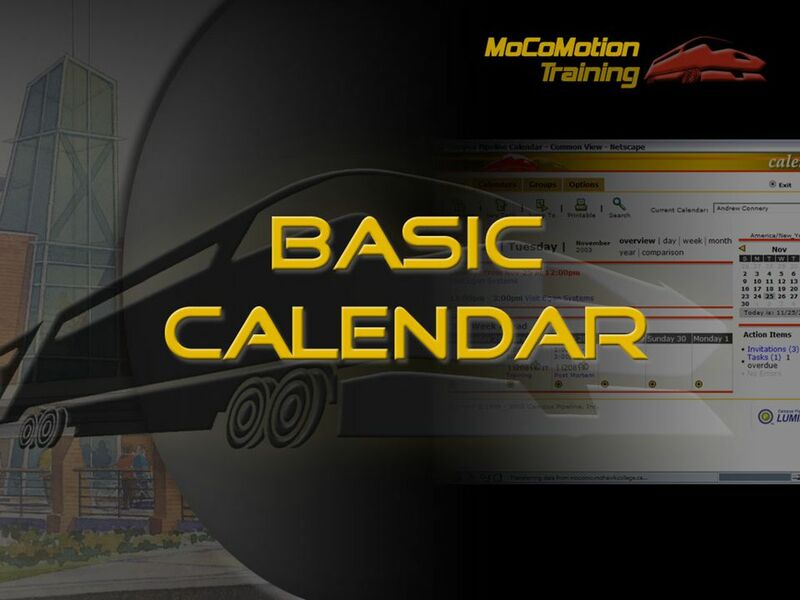 provide an overview of the Calendars application work toward familiarity with the commonly-used functions demonstrate functions and features provide and. 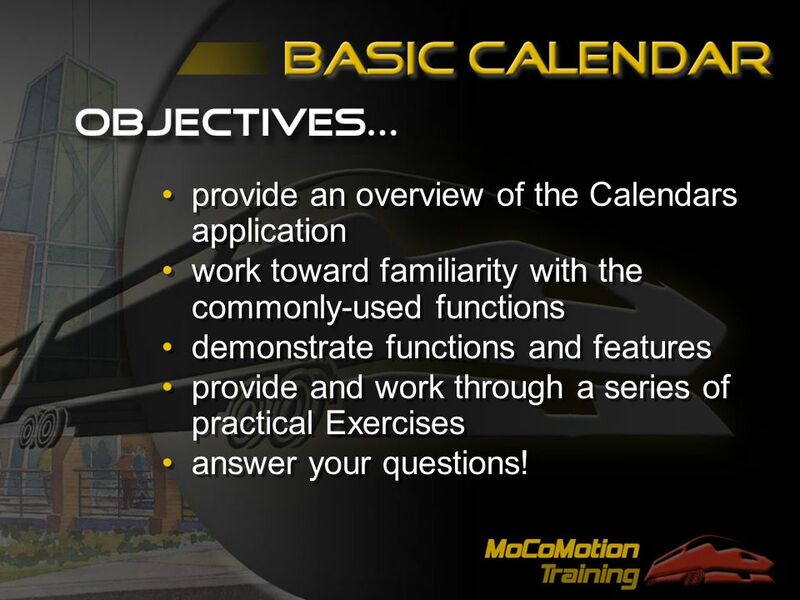 2 provide an overview of the Calendars application work toward familiarity with the commonly-used functions demonstrate functions and features provide and work through a series of practical Exercises answer your questions! 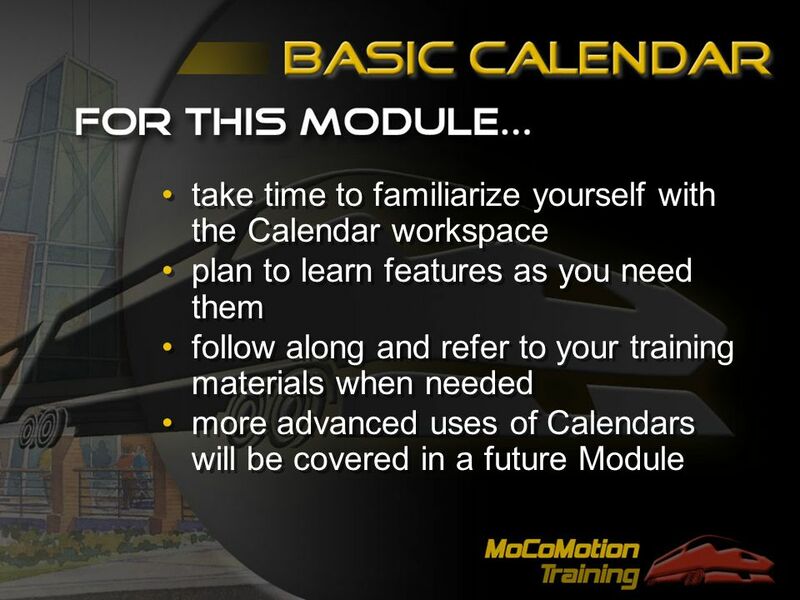 provide an overview of the Calendars application work toward familiarity with the commonly-used functions demonstrate functions and features provide and work through a series of practical Exercises answer your questions! 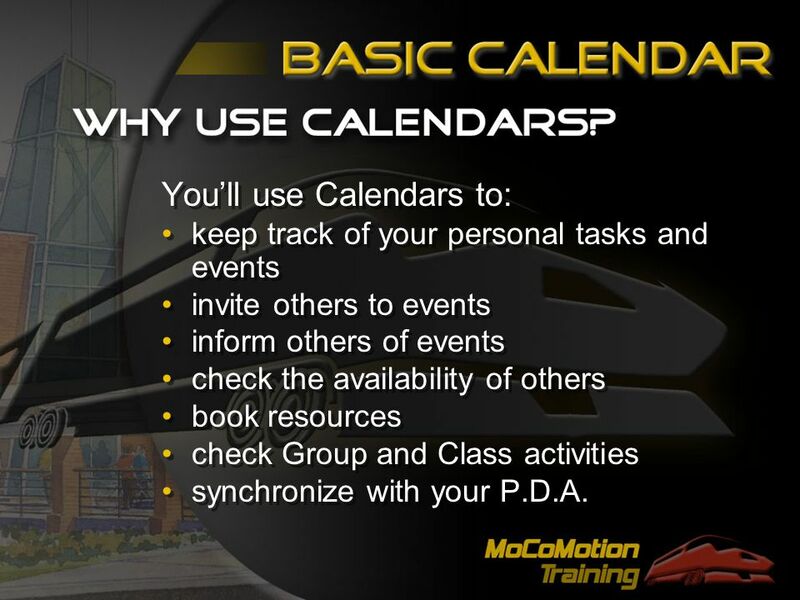 3 Presently, you all use calendars and many of you use electronic versions. 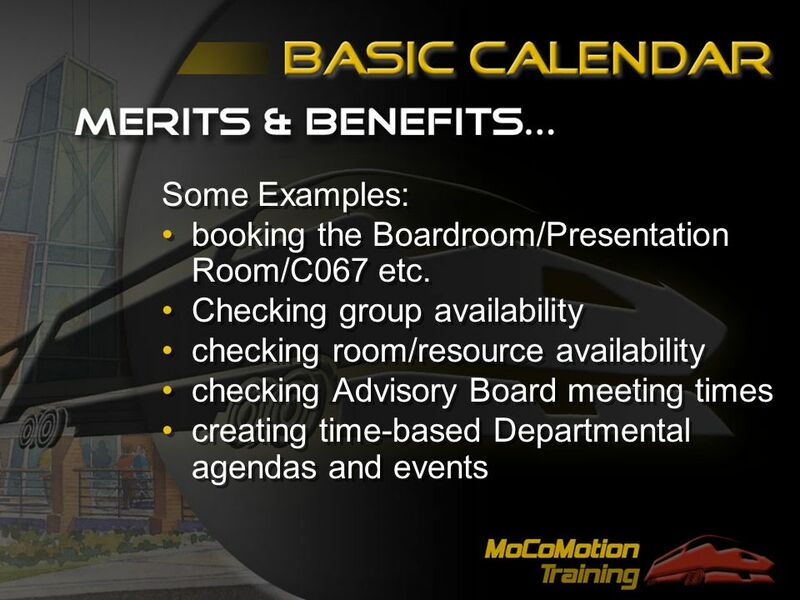 What’s different with MoCoMotion is that the Calendars are shared and that Calendars talk to Calendars. You can also consolidate all your Calendars into a single view! Presently, you all use calendars and many of you use electronic versions. 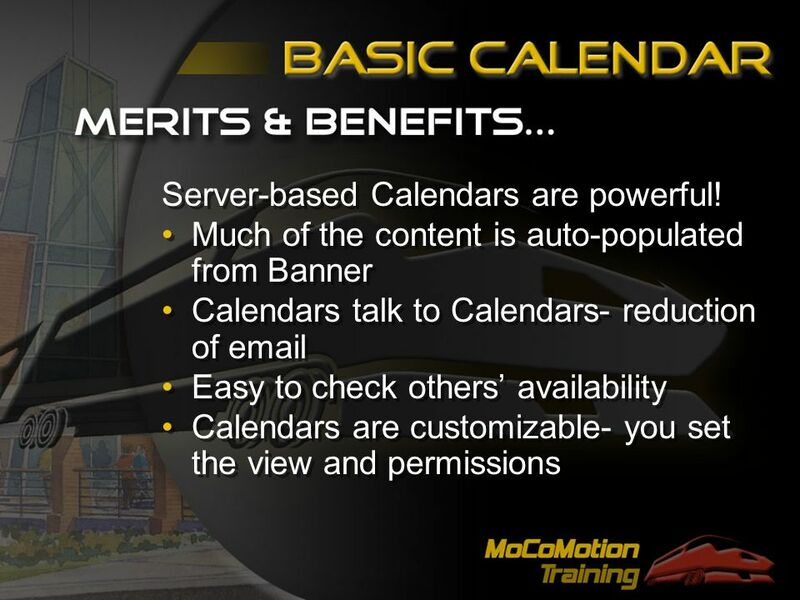 What’s different with MoCoMotion is that the Calendars are shared and that Calendars talk to Calendars. You can also consolidate all your Calendars into a single view! 4 You’ll use Calendars to: keep track of your personal tasks and events invite others to events inform others of events check the availability of others book resources check Group and Class activities synchronize with your P.D.A. You’ll use Calendars to: keep track of your personal tasks and events invite others to events inform others of events check the availability of others book resources check Group and Class activities synchronize with your P.D.A. 5 The spin-off benefit of proper Calendar use is a streamlining of work flow and reduction of personal e-mail. Isn’t that reason enough to use them? 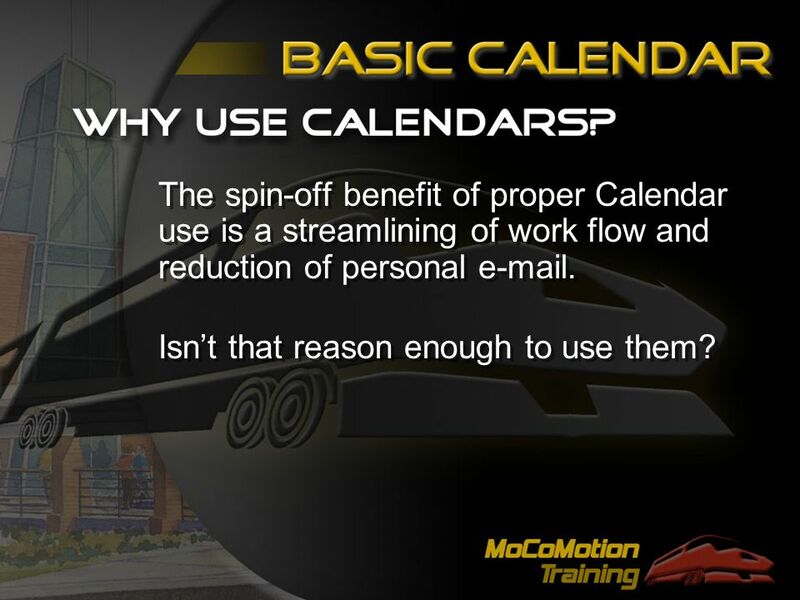 The spin-off benefit of proper Calendar use is a streamlining of work flow and reduction of personal e-mail. Isn’t that reason enough to use them? 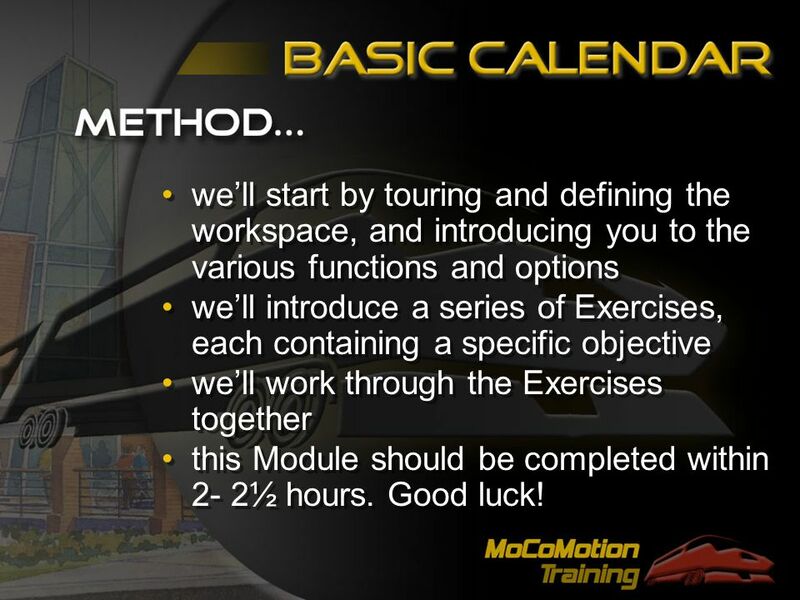 9 we’ll start by touring and defining the workspace, and introducing you to the various functions and options we’ll introduce a series of Exercises, each containing a specific objective we’ll work through the Exercises together this Module should be completed within 2- 2½ hours. Good luck! we’ll start by touring and defining the workspace, and introducing you to the various functions and options we’ll introduce a series of Exercises, each containing a specific objective we’ll work through the Exercises together this Module should be completed within 2- 2½ hours. Good luck! Download ppt "provide an overview of the Calendars application work toward familiarity with the commonly-used functions demonstrate functions and features provide and." When Loses Its Charm Team Collaboration Without Clogging Your Inbox Annette Marquis Gini Courter. Hotel Management System (HCMS). What is HCMS? Investment for hotel owners. 2010 Product Overview.  Introduction  Purpose  The Problems  The Solution  Getting Around  Main Modules  Content Management System  Room and Equipment. Google Confidential and Proprietary Apps 1 Intro to Talk Google Apps. VirtuOx 205- Executive Orientation and training series VirtuOx Technical Services Module 2. Collaborative tools in NICE Alex Lossent - CERN IT/IS Hepix Fall 2005. 1 of 3 This document is for informational purposes only. MICROSOFT MAKES NO WARRANTIES, EXPRESS OR IMPLIED, IN THIS DOCUMENT. © 2007 Microsoft Corporation. 1 Agenda Views Pages Web Parts Navigation Office Wrap-Up. 1 System – MS Outlook Brief Jan 2014. Christine G. Balmes Melissa Ann D. Callejo Mercy Carmela U. Dañez BLIS-III. Outlook 2007 Managing Your Time. Course contents  It’s all about choices  Get it right in the calendar  Finishing touches.